While having a big heart may be a compliment to some, it’s one of the many problems that one can develop as they age. Heart problems affect people of every age, indicated in the fact that nearly 14 million men and women in the US are coping with chronic heart disease. Yet, seniors are most at risk and most commonly the patients of heart disease care. Atherosclerosis aka Coronary Artery Disease – Coronary Artery Disease is a condition that occurs due to a buildup of plaque along the artery walls of the heart. This results in a reduced amount of blood flow to the heart and brain. In the elderly especially, atherosclerosis may amplify the inefficiencies of an already weak heart. Unfortunately, patients show no symptoms until it’s too late, when the plaque ruptures or the buildup reaches dangerous levels, blocking blood flow. There are ways to ward off this condition; treatments can include medications, medical procedures, exercise and a healthy diet. Hypertension aka High Blood Pressure – Caused by an excessive amount of pressure on the artery walls by a high concentration of blood and narrow arteries, hypertension affects more than half of all seniors. It develops gradually over time and can accelerate the onset of other health conditions, such as strokes, kidney damage and heart disease. However, this easily detectable condition is also easily counteracted — you or a loved one can decrease their risk of high blood pressure by lowering salt intake, exercising more often, quitting smoking or losing excess weight. Doctors are also able to prescribe medication in the event nonmedical actions are insufficient. Like Coronary Artery Disease, hypertension is often symptomless. Before the symptoms begin, employ the assistance of a Certified Nursing Assistant (CNA) or Home Health Aide (HHA) to help manage the health of you or a loved one. 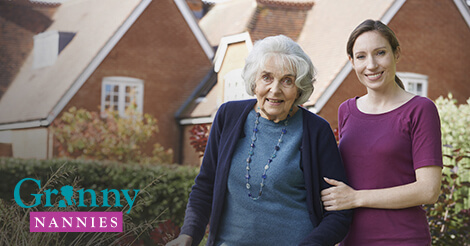 Granny NANNIES carefully screens the CNAs and HHAs referred to you or your loved ones to ensure they have the credentials, compassion and respect necessary to provide care to others. They can introduce precautionary lifestyle changes such as preparing healthy meals, encouraging daily exercise and managing stress. If a doctor noticed any of the precursory signs above and you or a loved one are in need of preventative assistance, the CNAs and HHAs referred by Granny NANNIES can help. They provide assistance in instituting the lifestyle changes mentioned above, as well as supervision, should anything occur. If you or a loved one has already suffered from a heart-related medical issue, the CNAs and HHAs are trained to provide the special care required and can do so in the privacy and comfort of home. Alongside dietary modifications and other preventative actions, CNAs and HHAs assist in routine, daily activities such as personal care, as well as with monitoring blood pressure or swelling and other physical and cognitive risk factors of another incidence.